What are the benefits of combining advanced lighting control strategies in the same space? Are the energy-saving benefits of lighting controls persistent over time? Can advanced lighting controls be successfully applied to open offices given concerns about jurisdiction conflicts, lighting uniformity, etc.? Can they enhance worker satisfaction? A new office lighting field study addresses these questions. Involving about 90 workers in a real-world open-office environment, the one-year study determined that occupancy sensing, daylight harvesting and individual occupant dimming control worked together in the building to produce average energy savings of 47% while correlating with higher occupant environmental and job satisfaction. The study demonstrates that sophisticated lighting control strategies can be combined successfully to generate persistent, large energy savings in open-plan offices while improving occupant satisfaction with their jobs and workspace. The one-year study occurred within four floors of an open-plan office building in Canada. The building selected for the project was attractive to the research team for several reasons. First, it contained a sophisticated control system operating in an open-plan office setting, an environment often perceived as unfriendly to sophisticated control strategies. Second, this control system combined three control strategies—occupancy sensing, daylight harvesting and individual dimming control. Third, the control system was already installed and in operation. Finally, the site manager was agreeable to the research team not only monitoring energy savings, but also surveying occupants on matters related to environmental and job satisfaction. Four years earlier, the building had installed 195 direct/indirect lighting fixtures to replace 530 recessed 2×4 T8 deep-cell parabolic fixtures. The new fixtures, centered over the cubicle workstations and containing 3x32W T8 lamps powered by two electronic ballasts, reduced installed lighting wattage by about 40%. The direct/indirect lighting system features advanced controls, while the parabolic system does not. Workers occupying 86 workstations on three and a half floors participated in the study by using the advanced controls, while workers on half of one floor were still using the old parabolic system, a setup that allowed a comparison between the two groups. Monitoring software was installed to collect detailed data for a period of one year. The direct/indirect fixtures contained an integral occupancy sensor and photosensor. 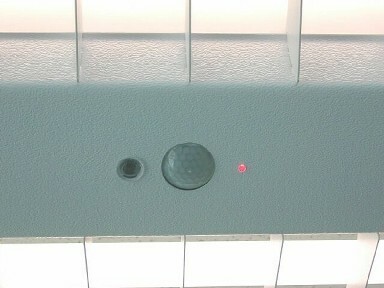 The center lamp, connected to a fixed-output electronic ballast, produced the indirect (uplight) component of the fixture; this ensured uniformity of light on the ceiling. The two outboard lamps, connected to a dimmable electronic ballast, produced the direct (downlight) component of the fixture; light output varied based on signals from four control inputs. If the occupancy sensor detected vacancy in the workstation below, it signaled the dimming ballast to gradually dim the downlight (outboard) lamps until reaching 0% light output, at which point they were switched off. If the sensor detected occupancy, it signaled the ballast to start the lamps and restore light output to the last set level. The photosensor monitored light levels on the below task plane, which received variable contributions from daylight available through windows. When light levels exceeded the occupant-set level, the photosensor signaled the dimming ballast to dim the downlight lamps. Occupants could also dim the lamps forming the direct, or downlight, component of their lighting fixtures via an on-screen slider on their desktop PCs, thereby enabling them to choose their own preferred task light levels. With this setup, researchers were able to study the overall effect of the combined control system, and estimate the relative contributions of each control type to the overall savings, for a period of one year. The study was conducted in three phases—phase 1 (39 workdays) with just the occupancy sensors and individual dimming controls active, and with a sensor time delay of 8 minutes with 7 minutes of dimming before shutoff; phase 2 (140 workdays) with all controls enabled, and with an occupancy sensor time delay of 12 minutes with 3 minutes of dimming before shutoff; and phase 3 (61 workdays), the same as phase 2 but with email reminders encouraging occupants to use the individual control feature in their workstations. Just before the study was initiated, the control system was recalibrated. As new employees were hired and entered the study area, or existing employees were re-assigned, the IT department, responding to a request from the energy manager, quickly re-enabled the individual control feature, which would prove critical in sustaining this control strategy. A fourth control strategy—global automatic on/off switching from a central point of control based on a daily schedule (7:30 AM to 5:00 PM workdays)—was in effect but not included in the study. By replacing the recessed parabolic fixtures with the direct/indirect fixtures, energy savings of about 40% were realized and lighting power density was reduced from about 0.92W/sq.ft. to about 0.54W/sq.ft. The combined control system increased lighting energy savings to 67-69% compared to the old parabolic system. Further, the direct/indirect fixtures operating with the control system produced 42-47% energy savings compared to if the fixtures operated at full light output without the controls. All energy savings resulting from the use of the controls were accompanied by concomitant demand reductions. Because the controls ensured that not all lighting power was used at any one time, the average lighting power density in use was about 0.28W/sq.ft. The site manager estimated a simple payback for the advanced system, based on energy cost savings alone, to be 2-4 years in a new installation and 4-12 years in a retrofit installation. If installed alone, the occupancy sensors would have produced an estimated average 35% savings, daylight harvesting 20% and individual dimming control 11%. 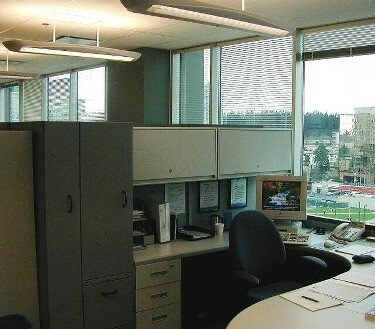 Daylight harvesting savings were higher in perimeter workstations, as would be expected (due to closer proximity to windows), and the researchers estimate that savings would have matched the occupancy sensor savings if perimeter fixtures had been allowed to dim below 50% output based on the photosensor signal (deeper dimming based on occupancy sensors or personal control was allowed). Occupant surveys demonstrated a correlation between the presence of the controls and higher job and environmental satisfaction. While individual dimming’s contribution to overall energy savings was relatively small, researchers credited the improvements in occupant satisfaction to the individual control feature. The researchers are currently looking deeper into the relationship between the controls and worker satisfaction, and hope to publish their results by 2009. The field study was supported by the Government of Canada, BC Hydro Power Smart and Ledalite Architectural Products.